These last couple months have been such a joy! I've been assisting a friend get a Sunday School program started for our growing church plant and we've decided to read through "The Jesus Storybook Bible" by Sally Lloyd-Jones through Zonder. Since we are still a small group, the age range is fairly wide: from three to ten. Finding projects to go along with the story has been a little trial and error, and a little bit of making projects up as I go! 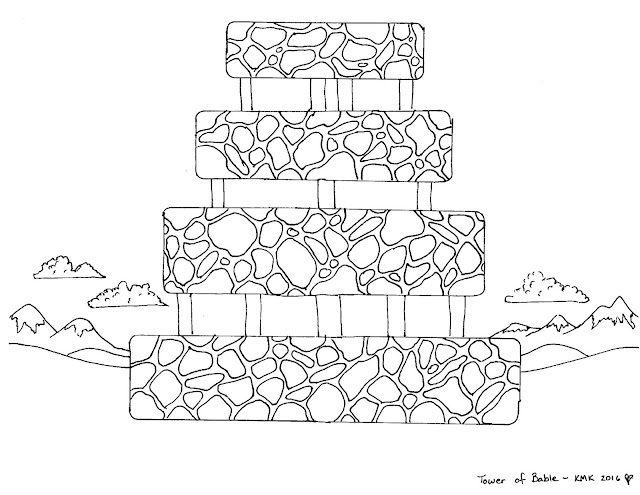 The basic idea is that you color it in, then cut along the top and bottom of each level. 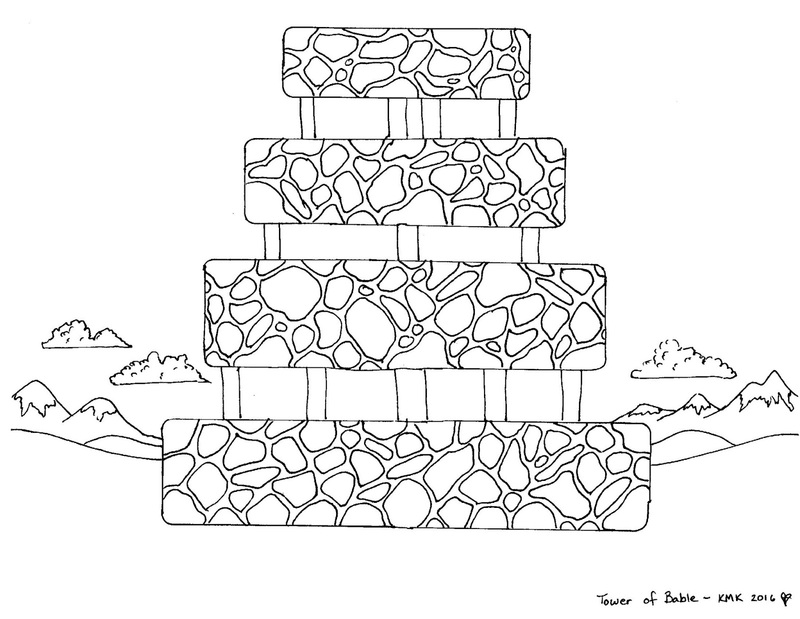 Then, fold the stone layers forward and the rest backward to make the building stand out. I think this would work well for a pop-up book, too, if you'd be so inclined! Click on image below to open full sized. To finish off the time after story, prayer, and this pop-up page, I brought in all our foam blocks and the kids broke off into teams. The team to build the tallest tower in a set amount of time won! It seemed a good time was had by all and my son was even able to re-teach me what he had learned that morning, so we're going to call it a win! =) I hope someone else out there can put these ideas to use again, somewhere! And I would love to hear how it works for you! Thank you so much for creating a template you are willing to share with all of us of the pop up Tower of Babel! Oh you're very welcome! I'm so glad to see it's being used! I'm always looking to make more free Sunday School printables, so if you have any thoughts, I'd love to hear them! Many Thanks from Germany! I´m teaching sunday school for pre schoolers and its often hard to find crafts that involve more than coloring in or unrelated crafts. Super happy and will definitely be using this tomorrow. I will pre cut everything and let the Kids colour in. Thank you! I'm so glad others can put it to use and teach the little ones about God! Hopefully I'll be able to add more projects in the future! Wow!You're awesome! Thanks for sharing! A wide range of letters in order disney coloring pages accessible over the web are an expansion of Preschool Alphabet exercises and specialties work. I went up to give her my typical hi kiss and didn't stand out enough to be noticed immediately as she was completely ingested coloring. i used this for my sunday school activity. thanks. God belss you. Muchas gracias por su aporte. Mañana lo usaré con los parvulos en la clase dominical. I'm so glad to hear this is being used! Thank you for sharing your wisdom with others in your lives! Thanks for sharing! I'm using this activity tomorrow in Brazil.